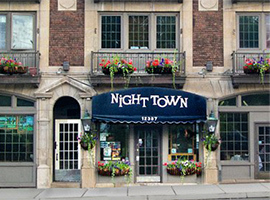 Nighttown, the storied jazz club and restaurant in Cleveland Heights, is named after the red-light district in Ulysses, the voluminous novel by James Joyce that is set in Dublin and considered by scholars one of the most influential works ever penned. The name is fitting because the history of this venerable hotspot is an unfolding Cleveland narrative with its own epic story to tell. Let’s linger here for a moment: You see, Ulysses explores the secular epiphany, that sudden, dramatic moment when a character figures something out. Here in Cleveland, many of us remember the epiphanies we’ve had at Nighttown, whether it’s hearing a great musician, having a great conversation over dinner, or just soaking up the atmosphere of this ancient-feeling tavern that’s been compared to a turn-of-the-century New York restaurant and an Irish pub. 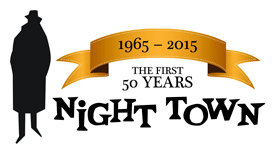 Next month, Nighttown is turning 50. It opened its doors on February 5th, 1965. The golden anniversary party on Thursday, February 5th will include an all-star lineup of Cleveland musicians who’ve played Nighttown over the years, including Joe Hunter, Jackie Warren, Ernie Krivda, George Foley, Sammy De Leon, Peter Dominguez, Lem Adams, Glenn Davis, Bob Fraser and Moises Borges (just to name a few). The celebration continues on February 13th when The Manhattan Transfer – the biggest act Nighttown has ever booked – rocks the house. Nighttown is many things to many people. Physically, it sprawls in Joycean fashion across three patios, three bars and six private and distinctly different rooms. It’s a bar, according to Irish-born owner and proprietor Brendan Ring (who was two when Nighttown opened) where characters “from plumbers to billionaires” rub elbows. It’s a white tablecloth restaurant where Cleveland friends and families mark all manner of rites of passages from christenings to wakes. And it's a pre- and post-orchestra and theatre supper club where performers and audiences mingle. It’s also the only jazz club in Ohio to be named one of the best in the world by Downbeat Magazine. Where the likes of Chucho Valdes played 15 years before the recent U.S. thaw in Cuban relations, and where local musicians have jammed with names like Wynton Marsalis, Stevie Wonder and Lou Rawls when they drop in after a big show downtown. Ring once turned down a yet-to-emerge Norah Jones, much to music producer Jim Wadsworth’s dismay, but okayed booking Esperanza Spalding the night before she appeared on The Late Show with David Letterman and would later go on to play at the White House for President Obama. Ring tells the story of how the original owner, John Barr, now 84 years old, opened Nighttown because he was “bored.” Barr had been working at the former Ski Haus up on Cedar Hill and was a regular at the The Silhouette Lounge, a mob-run bar down the hill. “In the 1960’s, the feds were hitting the Cleveland mob hard and encouraging them to get out of the liquor business, so [John] cashed in his mother’s life insurance policy and turned the one-room Silhouette Lounge with its pool table and formica into Nighttown,” Ring says. Ring credits Barr’s timing with making Nighttown a success, along with his simple menu of steak, lobster, salad and the two desserts that his mother made. He also tells a story of how Nighttown got popular. “As John tells it, it was the era of free love. Women were hanging out at bars more and he made an effort to ensure that Nighttown was a comfortable place for them,” he says. That, says Ring, coupled with the fact that “Nighttown has always been synonymous with writers,” led to Esquire Magazine naming Nighttown one of the top 10 pickup joints in the U.S. in 1969. “The press hung out here and women hung out here because they could meet smart guys. I’ve had women tell me they met their first and second husbands here." It was only a matter of time before Barr took over three additional storefronts one by one, and Nighttown would grow and so would the story. Another facet of the place is the “crazy eclectic artwork,” 275 individual pieces, all originals, no copies. “You can see the history of Cleveland on the walls,” Ring says. Again he credits Barr’s timing in acquiring the artwork. “In the 1960’s and 70s they were tearing down a lot of big old houses in Cleveland and John got some really good stuff at auctions,” including paintings and original Hollywood posters that were produced locally, back in the day when L.A. didn’t have the printing industry that Cleveland once had. Nighttown is also home to the The Press Club of Cleveland Journalism Hall of Fame and displays original newspaper photos and commemorative plaques of inductees. 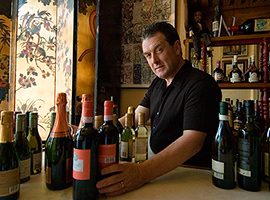 In 1992, Brendan Ring was just a bartender at Nighttown. His plan was to stay a year and then head back to New York City with his wife Siobhan. Nighttown had “run its course,” he said. But when the year was up, Barr asked Ring to become the manager and he accepted, making some changes that included adding brunch and starting “a bit of music to reinvigorate it,” he said. Noting the successful strategy, Barr then challenged Ring to hit certain targets, and if he could, he’d give him 20 percent of the business. Ring asked Barr how he would do that. “You figure it out,” Barr told him. It took Ring five years. Then Barr told him to figure out how to buy the whole joint. It took four more years and a bit of luck. One night, over beers, Ring was telling a customer a tale of woe about how no bank would lend him the money to buy Nighttown. The price tag was formidable as the deal included the buildings as well as the business. The customer, who turned out to be a banker, got Ring the loan in the spring of 2001. “He decided to have faith in me. It was truly an American Dream,” he says. The latest chapter in Nighttown’s evolution includes Ring adding three patios: “Steven’s Green,” named after the park in Dublin where Bloom began his day in Ulysses; “The Secret Garden,” a year-round enclosed patio; and the latest, the “Happy Tails Pet Patio,” which doesn’t even get its official signage until summer. He’s continuing a Nighttown tradition by already christening it the “hottest pickup joint in Cleveland Heights on a Sunday morning.” Dogs will be welcome anytime and served free scrambled eggs and bacon, and he says, “you get to ask the girl next to you what her dog's name is and take things from there.” Ring tells of a couple who’d met on the patio with their dogs before it was even dedicated, and who were married last fall. And of a guy who “went down on one knee” in the main dining room on Christmas Eve. Indeed, if you walk around the rooms, there are multiple plaques hanging amidst the artwork, marking where couples have met. Ring’s plans for Nighttown’s future include improving the venue’s “three legs”: the jazz club, private events and dining. “It’s not going to get any bigger but we’ll be improving aspects like the music room,” he says. Indeed, with 550 seats Ring says Nighttown is the biggest restaurant on the east side. “It feels intimate because of the way the rooms are carved out,” he says. A lot depends on what happens on Cedar Hill, where there is much talk of private development. “Right now I have 55 people here and my biggest challenge every 2 weeks is to get them all paid. Most of time it’s not too difficult, except in the early months of the year,” he adds. The story of what’s on tap has evolved, too. Just this past year, at the suggestion of a bartender, Nighttown began carrying 85 craft beers and now it’s attracting a whole new generation of clientele. “We’re always changing with the times. We have a hipster chef from a top vegetarian restaurant (if you can believe that) in Colorado who’s improving the menu,” Ring adds. Ring has figured out not only how to keep Nighttown alive and thriving, but how to keep it one of the longest-running, epic stories in Cleveland Heights. Happy Birthday, Nighttown. Read more articles by Christine McBurney. Christine McBurney is an educator, writer, theater artist, and Co-Artistic Director of Mamai Theatre Company. Her writing has appeared in The Plain Dealer, Belt Magazine, Northern Ohio Live, CWRU Magazine, and other publications. She lives in Cleveland Heights.